The bifurcated axial fan is a cylinder shaped unit with in line flanges for the flue connection; a pressure switch can be fitted to ensure safe operation. 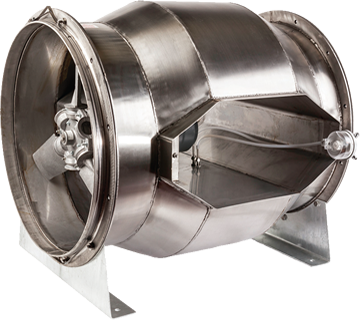 All bifurcated fans are individually sized and manufactured to suit a particular flue system, either dilution or induction. Please note that a drain plug may be fitted to the fan in manufacture if the fan is being installed within a condensing system. The fan will handle flue gases at up to 200 deg C with an average gas appliance working at 75% efficiency are 180 deg C with a C02 content 5%. The motor is a single speed unit with class F windings that is totally enclosed and maintenance free sealed ball bearings with adequate lubrication to ensure reliable operation for many years. This is an option which is suggested for use with modular boilers and is achieved by the use of an inverter. The inverter can be set up to alter the fan speed to suit high fire flow fire situations or when less modules are being used. We offer a bespoke service to install the pitot ports and pressure switch into the main body of the fan making it simple to fit which saves time and money on installation. The pressure switch will require setting after installation, then checked that it ensures fail-safe operation which switches off the boiler if it detects inadequate flow in the duct. The pressure switch must be checked regularly. The pitot tube and silicone tubing must be kept clear at all times which may be achieved by blowing air through the tubes and/or replacement if they are showing signs of deterioration. The pressure switch must be mounted in the vertical position with the connectors pointing downwards, this allows any condensate to drain out of the pressure switch (condensing boilers; high efficency boilers and dilution systems). The pressure switch may be mounted in the horizontal position with the electrical terminals pointing upward, in this position the switching values are approximately 20 pascals higher than the indicated scale. The pressure switch must never be mounted upside down. For detailed installation instructions with diagrams, please download the spec sheet. Installation instructions can be found on the spec sheet.